Flow cytometry is a laser-based technology used in cell sorting and analysis. 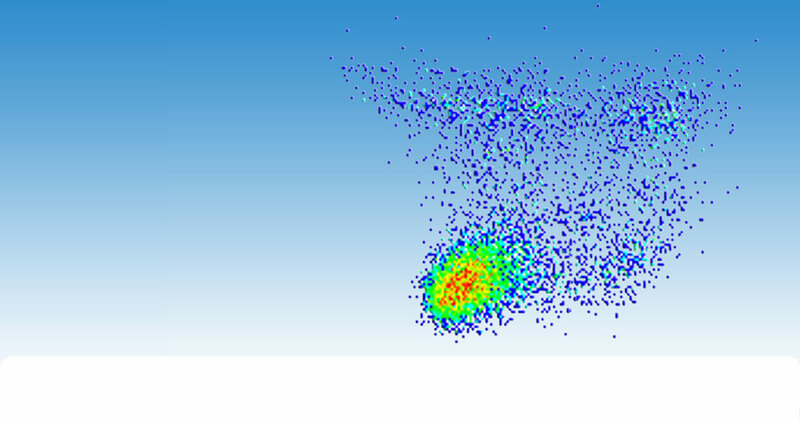 Flow cytometry measures a particle’s size, granularity, and fluorescence intensity. Flow cytometry continues to a be a very useful tool and its importance in scientific research and diagnosis is increasing. Flow cytometry allows researchers to measure several physical characteristics of cells including its shape, size, and internal complexity. It has long been used in cell counting and cell sorting but more recently, researchers have been using flow cytometry in a broad range of applications including: biomarker detection, cell signaling, pathway screening, protein engineering, and systems biology. Flow cytometry is inherently a robust technique that adapts easily to basic research, drug development, and diagnostics. Flow cytometry is a powerful tool that enables single-cell analysis of expression of different targets. Multiplexing different fluorophores and probes allows the collection of meaningful information and complete cell characterization. Use the Spectra Viewer to determine which assays and fluorophores can be multiplexed together. In addition, discover which dyes are compatible with the lasers in your flow cytometer. Enzo Life Sciences offers a variety of flow cytometry-based assays for cell viability, proliferation and death analysis, available in a wide range of formats to meet individual research needs. These flexible assays are compatible with all flow cytometry platforms, regardless of size or functionality. The assays are easy to perform and can be run quickly using small sample input, without sacrificing sensitivity. This portfolio has been designed to include multiple applications-driven configurations providing information on different parameters of interest. A simple assay to quantify senescence-associated β-galactosidase activity in live cells using flow cytometry or fluorescent microscopy. A no-transfection, quantitative live cell assay that identifies autophagy regulators by imaging and flow cytometry. Non-toxic, fluorescent labeling of live cells that can be used over extended time periods. Available with CYTO-ID® Green Tracer dye or Red Tracer dye. The only assay that detects aggresomes and aggresome-like inclusion bodies by flow cytometry. Simple mix-and-read assay for detection of DNA content in live cells. Available with NUCLEAR-ID® Green Cell Cycle reagent or Red Cell Cycle reagent. A live cell analysis assay for detection of nuclear condensation, one of the prominent hallmarks of apoptosis. Does not require installation of a specialized violet laser. Enzo Life Sciences cell-based phenotypic assays directly monitor global levels of reactive oxygen species (ROS) and evaluate the functional status of mitochondrial membrane potential in live cells. These flexible assays are compatible with all flow cytometry platforms regardless of size or functionality. The assays are easy to perform and can be run quickly while providing robust signal and high sensitivity. This portfolio has been optimized to provide maximum information from a single test. Many of the kits are provided in multiplexed configurations. Detection of hypoxia and oxidative stress levels in cultured human HeLa. Cells were treated with hypoxia inducer (DFO) and ROS inducer (pyocyanin). Numbers in each quadrant reflects the percentage of cells. Results indicate that hypoxia and oxidative stress dye are specific. The Enzo Life Sciences multidrug resistance assays are the only available kits for simultaneous monitoring of all three major ABC transporter proteins — MDR, MRP & BCRP. The high sensitivity of the assay delivers fewer false negative results, and provides data for BCRP activity not detected in Calcein AM assays. The kits are easily incorporated into a high content screening environment making them ideal for drug screening applications. ABC transporter protein activity was evaluated in CHO K1 cells by flow cytometry using EFLUXX-ID® Green (top), Gold (middle), or Calcein AM (bottom) dyes. 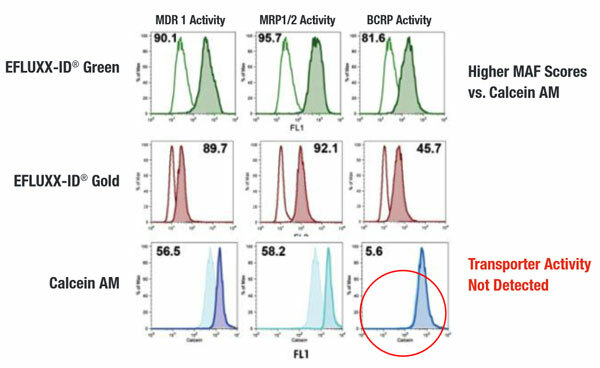 Treatment with specific inhibitors of ABC Transporter proteins (shaded histograms) induces retention of dye within cells relative to untreated cells (lined histograms). 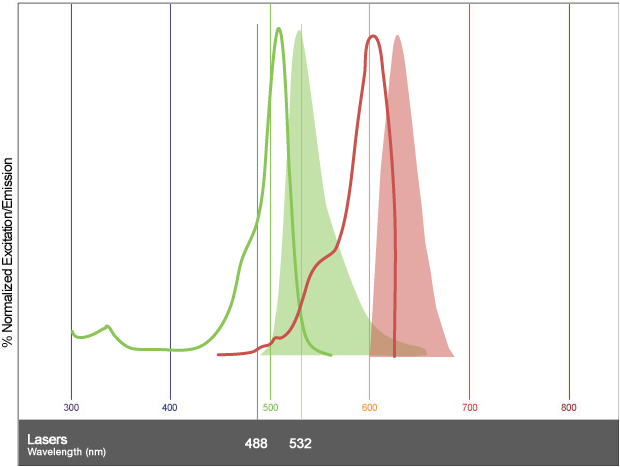 The difference in mean fluorescence intensity (MFI) is an indication of the corresponding protein activity, as shown by MAF scores [multidrug resistance activity factors], a quantitative measurement of multidrug resistance. Higher MAF scores are a result of superior specificity of EFLUXX-ID® dyes to specific inhibitors. Calcein AM (a common probe for MDR assays), is unable to detect BCRP activity. The assay employs a novel in situ hybridization technique utilizing a cocktail of probes specific to multiple sites within the E6 and E7 genes to ensure the detection of mRNA transcripts associated with the most prevalent high risk HPV genotypes.